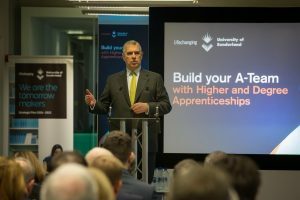 A North East agency has worked with the University of Sunderland on the brand and materials for a pioneering apprenticeships programme, launched at an event attended by HRH The Duke of York. Created by the University of Sunderland in response to the Government's wish to create three million apprentices by 2020, Higher and Degree Apprenticeships is intended to allow businesses to transform their performance by enhancing the skills of existing employees as well as attracting fresh talent. HRH The Duke of York launched the new programme at an event held in the University of Sunderland’s Sciences Complex, and Newcastle-based agency Everything is my Design created the initiative's marketing and branding. Its managing director, Mark Dawson, said: "We needed to create an overarching style, tone of voice and visual personality that appeals to employers across a wide range of sectors. “That visual personality was implemented across a range of multimedia applications including printed collateral, digital mailshots, the university website, event and campaign materials and many other items." The university is one of only 18 universities in the UK chosen to receive Government funding to support its drive to increase apprenticeships across the country. Meanwhile, Everything is my Design has set its sights on expansion throughout the UK. “2016 was a real defining year for us,” added Dawson. "We feel we have a greater ability to show clients exactly what we do with their budgets and why and we're looking forward to expanding our reach throughout the UK."